Do not worry – the paintings will not melt in the sun! The melting point for wax mixed with damar is about 160 F or 70 C and if you find yourself in that sort of heat, you have other things to worry about! Having said that, you should avoid extreme temperatures such as leaving a painting in a hot car, or transporting a painting in very cold conditions as this can soften or crack the surface. 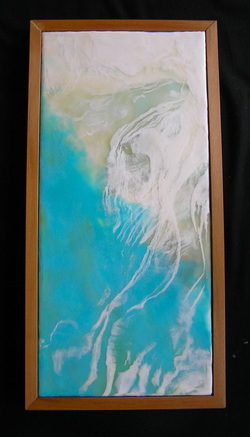 And like all paintings, encaustic artwork should be kept out of direct sunlight. After a while, a whitish ‘bloom’ may appear on the surface of the painting. This is a natural part of the beeswax hardening. You can simply use a lint-free cloth to polish the painting’s surface to remove the bloom. The edges and surface of the painting need to be treated with care (again just like any other painting). They can be damaged by sharp objects such as fingernails. If this occurs, it is best to return the painting to the artist for repair. To transport the paintings, wrap them in bubble wrap and blankets, then place them in a suitable box. Placing some wax paper between the painting and the packaging helps to keep the surface safe. The paintings can be framed (without glass) to protect the edges.